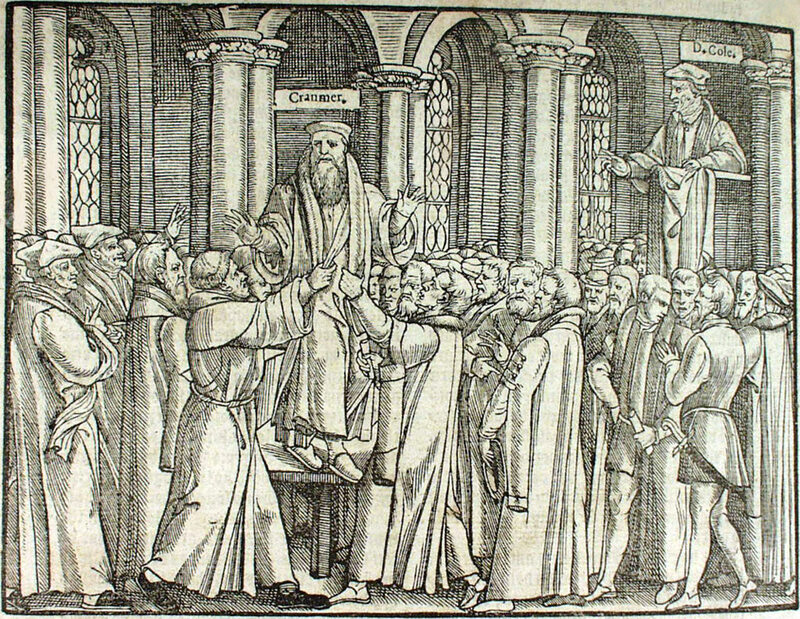 On 12th September 1555 the trial of Archbishop Thomas Cranmer began, he was charged with two offences – repudiating papal authority and denying transubstantiation. His trial was held in the University Church of St. Mary the Virgin at Oxford. At the east of the church a ten foot scaffold was built where James Brooks, bishop of Gloucester and representative of the Pope sat and below him sat Dr Martin and Dr Storey who were acting as Queen Mary I’s commissioners. After Cranmer spoke his mind regarding the authenticity of the court he knelt and recited the Lord’s Prayer after his prayer Dr Martin asked Cranmer who he believed was in charge of the Church of England. Cranmer responded ‘Christ is head of this member, as he is of the whole body of the universal church’. When pushed further regarding the appointment of King Henry VIII as the head of the church Cranmer elaborated further by saying ‘Yea, of all the people of England, as well ecclesiastical as temporal… for Christ only is the head of his church, and of the faith and religion of the same. The king is head and governor of his people, which are the visible church’. With Cranmer had been able to speak the commission ordered him to appear at Rome to answer to the Pope and returned to his cell. The commission never took the Archbishop to Rome but on 4th December the Pope stripped Cranmer of his office and gave the relevant authorities to pass sentence on him. With Cranmer being told of the Popes decision he began to recant and by February 1556 he had recanted four times and recognised the Pope as the head of the church.